It’s nice to see that Spring’s on its way and hopefully the weather will be kind when our French visitors arrive to visit us in late May. A number of things are planned, including a coach trip to Oxford for some sightseeing and an evening meal at a local golf club. We have provisional numbers for those coming from Ste Pazanne, including some newcomers. At the present time we are in need of a couple more English hosts to provide accommodation for the four-day visit. If you feel you could help or would like to get involved please contact any of our committee members. We will provide help and support for anyone new to ‘twinning’. We have been twinned with Ste-Pazanne since 1995 the majority of our committee have been involved since day one. While not quite past our ‘sell by date’ we are now looking for fresh members to continue the partnership, to ensure to the longevity of our association into the future. If you’d like more information please have a look at our website or please feel free to contact one of our committee who are always happy to give you an insight into what we’re about. We will shortly be carrying out a leaflet drop in the surrounding area to help promote our association. FORTHCOMING EVENTS - Please contact any of our committee (please see our 'Contact' page for details ) for tickets or further information. Spring Event – Plans are still under way! 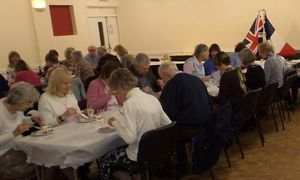 29th May to 2nd June 2019 – Visit to Harrold from Ste Pazanne. July 2019 – Our annual Bastille BBQ. Date to be confirmed. Autumn 2019 - Afternoon Jazz Tea.